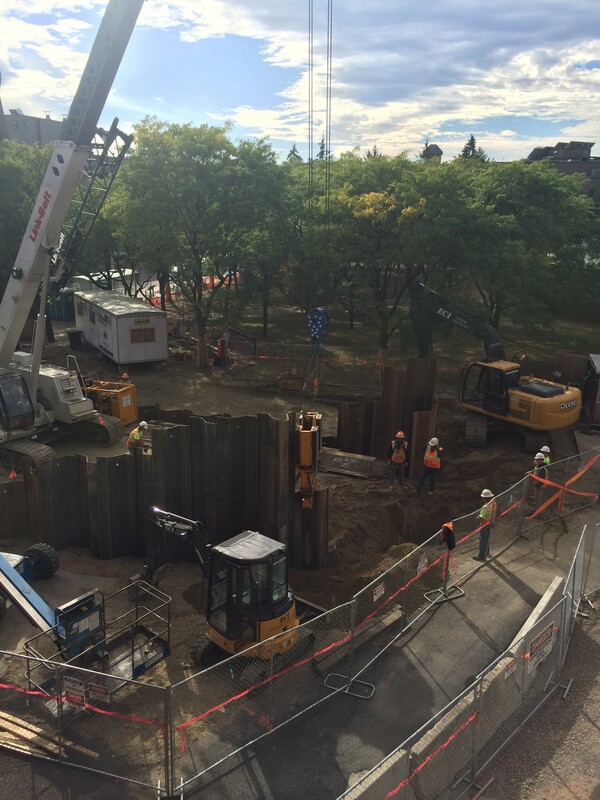 Steel piles being hammered into the ground on St. Paul Street. People living on the northwestern edge of downtown Burlington have noticed their windows rattling and floors shaking. Several residents have contacted the mayor's office or inquired about the phenomenon on Front Porch Forum. Normally hallmark indications of an earthquake, these tremors, it turns out, are manmade. They're coming from the construction of the Chittenden County Transportation Authority's new transit center on St. Paul Street. More specifically, explained CCTA project manager Stephen Carlson, they're caused by a massive hammer that is driving steel piles nearly 30 feet into the ground. The tall strips of steel will prevent dirt from caving in when workers start excavating in preparation for laying the foundation. The station is being built next to a church, several office buildings and the Burlington Town Center mall. Carlson said he's been regularly visiting people at the surrounding buildings to make sure the noise levels and vibrations aren't too intrusive. He's also placed a seismograph — an instrument generally used to measure the force and duration of earthquakes — in Vermont Health Commissioner Harry Chen's office, which overlooks the construction site, to make sure the vibrations aren't significant enough to impact the structural integrity of nearby buildings. A rendering of the future transit center. Carlson, who said he hadn't anticipated that the vibrations would affect residents living on the outskirts of the project, noted, "We are trying our hardest to reduce the amount of discomfort." The $7.7 million construction project — 80 percent of which is federally funded — should be complete by next fall. The transit station will have an indoor waiting area and restrooms for riders and a break room for drivers. Outdoor platforms will have buttons that activate radiant heat. As for the vibrations, those should stop sometime next week, although the hammering will briefly resume later this fall — when the steel piles will be removed. Burlington's gleaming new Downtown Transit Center opened Thursday with a ceremony featuring a slew of city, state and federal officials. Here are seven things to know about the new bus station.